YORKTOWN, Va., September 21, 2018 – The 237th anniversary of America’s decisive Revolutionary War victory at Yorktown will be marked on Yorktown Day, Friday, October 19, at Yorktown Battlefield, administered by Colonial National Historical Park, an annual event that will feature a patriotic Yorktown Day Parade and Commemorative Ceremony at the Monument to Victory and Alliance, also known as the Yorktown Victory Monument. In addition to morning wreath-laying ceremonies, the official Yorktown Day Parade begins at 10:30 a.m. 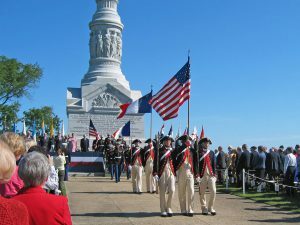 The route will follow Yorktown’s Main Street and pass in front of the Monument to Alliance and Victory, erected in 1881 to commemorate the military victory a century before. Included in the 35 parade units are representatives of all branches of the U.S. military, fifes and drums corps – including The U.S. Army Old Guard Fifes & Drums Corps – JROTC and NJROTC units, and patriotic organizations. The Old Guard Fifes & Drums Corps will perform at 1:00 p.m. at the Yorktown Battlefield Visitor Center, and Revolutionary War guided tours by Living History Associates will be offered at 1:45 p.m., 3:00 p.m. and 4:00 p.m. The American Revolution Museum at Yorktown will offer a public lecture at 3 p.m. Friday, October 19, by historian and author Ray Raphael. In “How to Listen and Win Wars,” Raphael will explore General George Washington’s willingness to consult colleagues on military decisions. A book signing will follow the lecture. 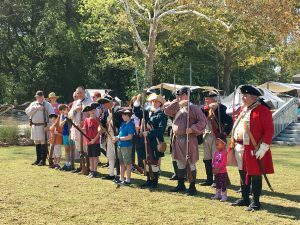 During its annual “Yorktown Victory Celebration” event on Saturday and Sunday, October 20 and 21, the American Revolution Museum at Yorktown will present a variety of hands-on experiences, artillery firings and military music. Stories of citizens and soldiers of the American Revolution unfold at the expansive history museum through an introductory film, exhibition galleries and outdoor re-creations of a Continental Army encampment and Revolution-era farm. Visitors can interact with Revolutionary War re-enactors, take part in interpretive demonstrations, and experience the “Siege of Yorktown” immersive theater. Visitors can take in the ongoing “Blast from the Past: Artillery in the War of Independence” special exhibition that examines the American, French and British artillery used during the Siege of Yorktown. In conjunction with the weekend celebration, the William & Mary Symphony Orchestra will perform 12 musical compositions in salute to the military, culminating with Tchaikovsky’s “1812 Overture” accompanied by artillery. The symphony performance will begin at 3:30 p.m. on Sunday, October 21. The American Revolution Museum at Yorktown, open 9 a.m. to 5 p.m. daily, is located on Route 1020 in Yorktown. Special events are included with museum admission: $15.00 for adults, $7.50 for ages 6-12, and free for children under 6. Residents of York County, James City County and the City of Williamsburg, including College of William and Mary students, receive complimentary admission with proof of residency. “Yorktown Victory Celebration” activities are presented in part by the York County Arts Commission. For more information, call (888) 593-4682 toll free or (757) 253-4838, or visit www.historyisfun.org. Riverwalk Landing will be filled with exciting attractions and entertainment for this momentous local anniversary. Enjoy Yorktown’s waterfront farmers market Saturday, October 20, from 8 a.m. to 12 p.m. Then, bundle up and set sail on the York River when you book a ticket on the Schooners Alliance or Serenity, which depart daily at 11 a.m., 2 p.m. and 4:30 p.m. from the Riverwalk Landing piers. Water Street Grille and Yorktown Pub will offer live music Friday and Saturday evenings, and Riverwalk Restaurant will serve its Sunday brunch buffet from 10 a.m. to 2 p.m. Learn more about Yorktown’s special events at www.visityorktown.org or call (757) 890-3500.